One of the greatest conga players of our time is Giovanni Hidalgo, and this ten minute solo is well worth watching until the end (and indeed, the following short tune as well). While most congueros use two or three drums, Hidalgo plays no less than six, which makes melodic playing possible. Not only is he playing lightning fast and with amazing technique, but most importantly, he is very musical. At one point, he throws in a melodic phrase from the song Oye como va. There have been countless collaborations between big bands and artists from other genres, from pop to folk music. Some of those have been really good, others not, but often they take the shape of the solo artist/band being accompanied by the big band. 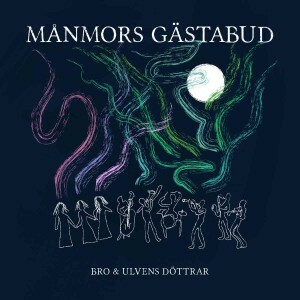 One project that I really like is the collaboration between the Finnish-Swedish big band Bothnia Rhythm Orchestra and the three singing sisters that make up the folk music trio Ulvens Döttrar from the Åland islands in the Baltic sea. What’s so great about this is that I don’t get the impression that one band is accompanying the other. In fact it does not even sound like there are two bands at all, but rather like one big unit. The songs on this album are all written by the sisters, except two compositions, and arranged by the artistic director of the big band in a brilliant way. These videos are from a concert at the jazz festival in Umeå, Sweden. This also includes a song that is not on the album. This is my Lira review of the record. Det är långt ifrån alltid det blir särskilt lyckat när exempelvis folkmusik kläs i storbandsdräkt, men så är verkligen inte fallet med Månmors gästabud. Botnia Rhythm Orchestra är ett finsk-svenskt storband som är verksamt på båda sidor av Östersjön, och folkmusikgruppen Ulvens Döttrar hör hemma mitt i densamma, närmare bestämt på Åland. All musik i detta samarbete är nyskriven, huvudsakligen av en av trions medlemmar, och ypperligt arrangerad. Variationen är mycket stor, från den inledande, suggestiva Genom jorden, vars sångstämmor slingrar sig om varandra, till den kraftfulla Davaj, med tunga rytmer och rått nyckelharpsspel. De tre systrarna Grüssner som utgör Ulvens Döttrar är huvudsakligen sångerskor, men deras inslag av bland annat mungigor smälter oväntat väl ihop med storbandet, och just det utgör även en otippad klangbotten till basklarinettintrot i en låt. Månmors gästabud är inte folkmusik som kompas av ett storband, inte ens upplevs det som att det är två olika grupper som spelar tillsammans, utan här smälter verkligen rösterna och BRO samman till en enhet. Därför, och inte minst tack vare starka låtar och mycket skickliga musiker, är detta en alldeles utmärkt skiva. The fine radio channel NPR Music recently made a video and radio documentary about Snarky Puppy, one of the busiest jazz-related bands around, playing up to 200 shows a year! Several live cuts from a gig in Dallas, near where the group was originally formed, are combined with documentary sections where band leader and bassist Michael League talks about his way of composing and where his inspireation comes from, among other things. The radio piece is almost twice as long as the video, and I recommend watching/listening to both as it’s very enjoyable to see the band on stage. Snarky Puppy has just released their most recent project, the DVD/CD Family dinner vol. 2, where an extended version of this already rather massive band performs with different guest artist on each track. Some of the videos are on youtube, and this one featuring vocalist Becca Stevens and the legendary Swedish folk band Väsen is really cool. Other guests on this project include Salif Keita, David Crosby, Susana Baca and Charlie Hunter. Christmas is not even a week away, which means that for the past weeks there has been Christmas songs playing on the radio, TV, and almost everywhere. I absolutely hate Christmas music! If I could make one genre of music vanish forever, this would definitely be the one. But there are, however, two records of it that I actually not only like, but really enjoy. Probably the most eclectic band I have ever heard, New Yorkers Tribecastan do their very personal take on a bunch of classic Christmas songs on their EPs Coal again and The twisted Christmas. In the usual Tribecastan style, they mix countless styles and instruments from all over the world, including yayli tambur, mandocello, trombone, congas, marimba, baritone sax, lap steel, accordeon, sitar, steel pans and many more. The American radio channel NPR has for several years been making a series entitled Tiny desk concerts, in which artists do short performances live, not in a regular radio studio but behind a desk in an office. More than 400 such shows have been made, and the videos are available online. This is a true goldmine of music, including a multitude of genre like jazz, pop, funk and country, but also classical string quartets, improv, afrobeat, flamenco, and classical and folk music from all around the world. Every concert lasts between around 10 and 25 minutes. Below I embed some of my favorite shows, but I strongly urge you all to go through the massive archives and fine your own favorites. The Roma brass band Fanfare Ciocarlia from Romania puts on a highly intense show, as always. Paolo Angeli from Sardinia takes the prize for the weirdest instrument, with his heavily modified baritone guitar that’s fitted with several sets of strings, foot controlled hammers to play bass lines, effect units, and much more. The Kronos Quartet are magnificent as usual. One-of-a-kind double bass virtuoso Renaud Garcia-Fons did an amazing solo performance. Somehow the 21 (!) musicians and two cheerleaders that form Mucca Pazza managed to squeeze in behind (and on) the desk, and even found space to do choreographys for their hilarious take on marching band music. So Percussion picked up various objects from the office, including coffee mugs and an amplified cactus (! ), and used them as instruments in their concert.